Built in 2006 by Great Gulf, The Villas at 18 Yorkville stand 7 Storeys High with 97 Suites. Located on Scollard near Yonge, 21 Scollard Street, Toronto is conveniently located in the heart of the ritzy Yorkville - Annex neighbourhood. This is one of Toronto's most dynamic communities, with endless possibilities for entertainment. Residents of The Villas at 18 Yorkville are steps away from world class shopping at The Eaton Centre, a plethora of cafes, patios and luxurious gourmet restaurants throughout Yorkville, as well as green space found in Queens Park. 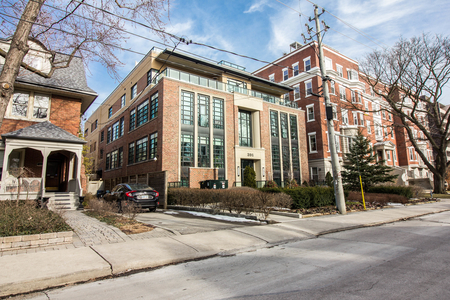 18 Scollard Street is also within minutes of TTC access, Grocery stores, art galleries and The Yorkville Public Library. The Villas at 18 Yorkville feature floor to ceiling windows for lots of natural light, upgraded finishes, a variety of layouts, engineered hard wood floors and high end appliances. Click here for Real-Time Listings, floor plans, amenities, prices for sale and rent in The Villas at 18 Yorkville at 21 Scollard Street, Toronto, updated daily.